Jason Wade, founder and lead singer of Lifehouse, was only 19 when his hit song ‘Hanging By A Moment’ took his band from obscurity to pop stardom. One minute, the band’s label Dreamworks was paying people to come to their gigs, and the next, the band was opening arena shows for Matchbox 20. On the just released Who We Are, Lifehouse’s fourth album, Wade – along with bassist Bryce Soderberg and drummer Rick Woolstenhulme – gets back to the loose, freewheeling approach to writing and recording that led to that first hit and the band’s subsequent success over the past seven years. ‘Hanging By A Moment,’ from Lifehouse’s 2000 album debut No Name Face, was an across the board smash, hitting #1 on Billboard’s Modern Rock and Adult Top 40 charts and #2 on the Hot 100. Impressively, No Name Face was certified double platinum. 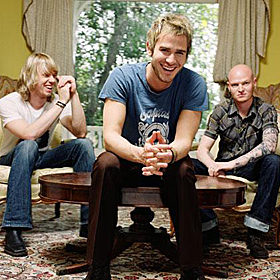 Then in 2005, Lifehouse scaled the Modern Rock and Adult Top 40 Charts again with the hit ballad ‘You And Me,’ which reached #5 on the Hot 100 and appeared on the soundtrack of the TV series Smallville. Notably, the band’s albums Stanley Climbfall (2002) and the self-titled Lifehouse (2005) were both gold-selling efforts. ‘First Time,’ the debut single from Who We Are, is keeping the momentum going as the band tours the U.S. this summer with the Goo Goo Dolls. Upon its release in May, the single became the #1 most added track at Adult Top 40 Radio. The song, a fond look back at the excitement and initial rush of romance, quickly rose to the Top 10 on Billboard’s Adult Top 40 Tracks chart. Another powerful moment during the making of Who We Are happened after 11 tracks were done and everyone thought that the project was completed. Wade took a trip to Nashville to visit a friend of his, Scott Faircloff, who was in the hospital in need of a new kidney. This friend was the one he says taught him his first chords when he was a kid. In the past, Lifehouse has worked with several notable producers, including Ron Aniello (who helmed their first two records) and John Alagia, who produced and played multiple instruments on their self-titled 2005 album. On Who We Are, Wade and his band handed the reins to hit writer/producer/artist Jude Cole, who has also managed Wade since the singer was 16. Cole had executive-produced the band’s previous album, which was recorded at Ironworks Records studio, which Cole co-owns with actor Kiefer Sutherland. As a songwriter, Wade has long believed that there’s simply no way to sit down with the intention of crafting the perfect song – if he’s not inspired or honest with himself, it’s just not going to mean anything to him or the listener. One song on Who We Are takes the singer back to his early days when he was first learning to express himself with music and lyrics; he wrote the album finale ‘Storm’ when he was 16 and going through some hard times. The original version of the tune was included on the band’s first indie record, when they were known as Bliss and pressed a modest 1,000 copies; that version has been circulated over the internet by the group’s fans and was even licensed by the TV show So You Think You Can Dance. Wade decided to re-record it when he realized how much it meant to people.